Staff at Dounreay have united their resources and donated over �0 to help Caithness Talking Newspapers spread the news to locals and exiles across the UK. 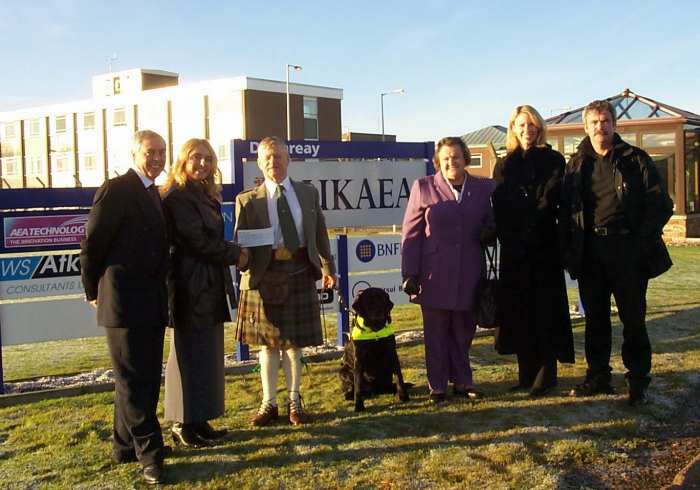 Dounreay's appeals and donations fund, the employees charities fund and members of UKAEA Constabulary all chipped in following the group's recent appeal for a replacement tape duplicator to safeguard and enhance the service to the visually impaired in the far north. The group was established nearly 20 years ago after the fund-raising efforts of the founder member Jessan Mackay of Castletown. The group has no regular income and depends solely upon voluntary donations and bequests. It has steadily grown to become a recognised service for the locally visually impaired and a vital link in keeping them abreast of events happening in their community. David Richard-Jones, secretary of CTN, said: "The replacement tape duplicator will enable us to speed up the copying of tapes and get the tapes to the Royal Mail earlier and thus delivered to our clients the same day as the newspaper is published. We are really grateful for the support of the Dounreay management and staff for their generous donations to our fund-raising project. I know that I speak on behalf of all our grateful clients when I say that keeping in touch with the local news is even more important when poorly sighted and Dounreay's help is invaluable in maintaining this vital service". There are over 60 visually impaired members of all ages, living in Caithness and other parts of the UK, who are provided with a weekly 90-minute tape of the local news from the 'John O'Groat Journal' and 'Caithness Courier'. The tapes, kindly donated by Grampian Records in Wick, are recorded and duplicated each week by a group of unpaid volunteer readers and copiers, in premises provided by The Royal British Legion Scotland free of charge. Additional volunteer readers and duplicators are always welcome. Jessan Mackay, who recently attended Dounreay to collect the donations, said: "On behalf of all the listeners of CTN I would like to thank everyone at Dounreay for their generous donations to this appeal. I would also like to thank David Richard-Jones for his continued work as our Secretary and to all whose support makes the service possible. It is much appreciated." Tina Wrighton, who co-ordinates Dounreay's appeals and donations fund, said: "Dounreay has a long tradition of providing assistance to a wide range of community initiatives in the local area each year. The fact that members of the UKAEA Constabulary and the employees charities fund also wanted to assist the request from Caithness Talking Newspapers underlines just how highly regarded this service is to the community."